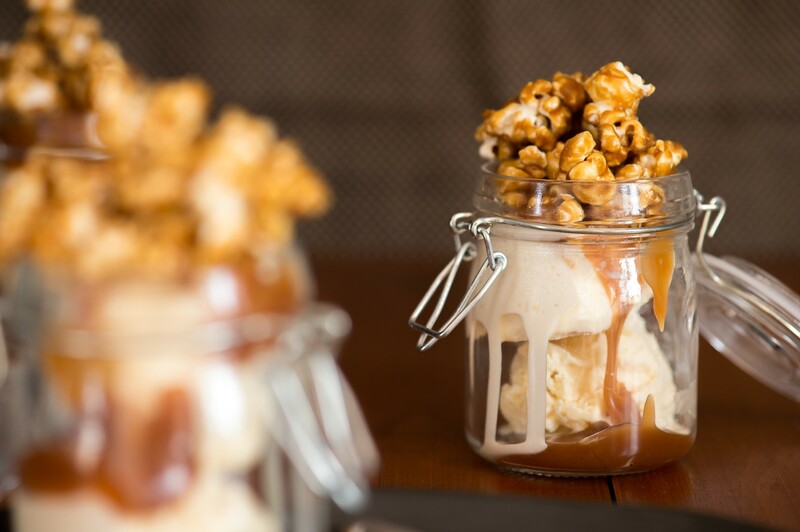 The combination of ice cream, popcorn and caramel may seem a little strange at first but let me assure you, it is a wonderful combination indeed. The slightly salty, crunchy popcorn adds a totally new dimension to the sweet, creamy vanilla ice cream. Smother this in rich, salted caramel sauce and you have yourself a Caramel Popcorn Ice Cream Sundae to die for! As with many things in life, homemade is so much better than shop-bought. This is definitely true of caramel popcorn. I find the shop-bought variety sickly sweet with only a mild caramelised flavour in comparison to this recipe. Not convinced? 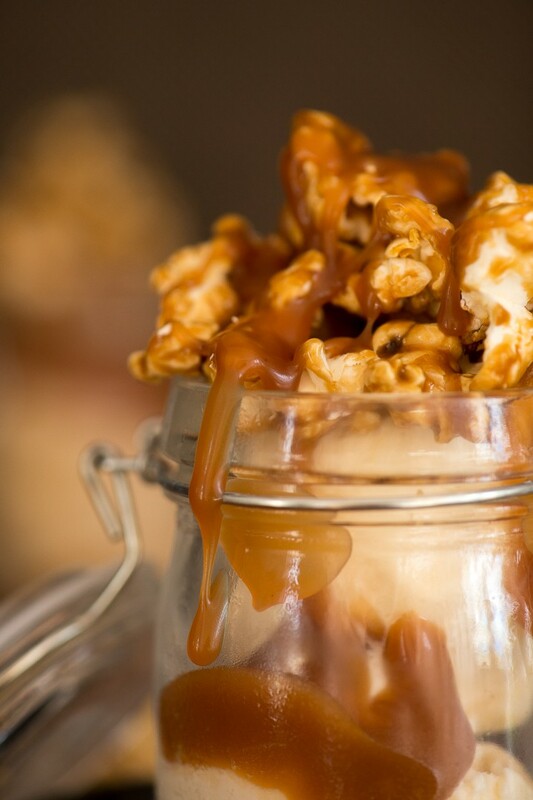 The tempting aroma of the toasty caramel-coated popcorn wafting through the house is reason enough to make your own! I highly recommend making your own vanilla ice cream with real vanilla. The flavour, the texture, the little vanilla seeds – it’s simply next level! But if you must take a short-cut with this recipe rather buy the ice-cream and make the popcorn instead of vice versa. You will definitely have some caramel popcorn left over, but it keeps well in an airtight container. Start by making the ice cream. Remember to freeze your ice cream maker bowl for a minimum of 24 hours. Place the milk and 125ml of cream into a medium saucepan on low heat. Split the vanilla pod and scrape out the seeds. Add both the seeds and the pod to the milk mixture, as well as the salt. Heat on low heat, stirring occasionally until the mixture just start to bubble around the edges. Remove from the heat and leave to infuse for 30 minutes. Whisk the egg yolks and sugar together until pale and creamy, then gradually add in the milk mixture, whisking constantly. Pour the remaining 250ml of cream into a large bowl, and place a fine sieve over the top. Strain the custard into the cream and mix well. Leave to cool to room temperature, stirring occasionally (you can speed this up by placing the bowl into an ice bath). Cover the surface of the ice cream mixture directly with clingfilm and refrigerate for 12 hours or overnight. Churn the mixture in your ice cream maker as per the manufacturer’s instructions. Transfer to an airtight container and freeze until ready to serve. Make the Salted Caramel Sauce as per the directions. Next, make the Caramel Popcorn. Preheat the oven to 100°C and line 2 large baking trays with greaseproof paper. Spread the popped popcorn out evenly over both trays. Melt the butter in a medium saucepan, then add the brown sugar, glucose syrup and salt. Stir occasionally over a medium heat until the sugar has dissolved. Bring to a boil, then boil for 5 minutes, stirring constantly. Remove from the heat, then add the bicarbonate of soda and vanilla – it will bubble up. Immediately pour the caramel sauce equally over the 2 trays of popcorn. Stir to coat (this gets tricky as the sauce starts to harden quickly, but don’t worry it be coated more evenly after baking). Place the trays in the oven and bake for 1 hour, stirring every 10 minutes. Once baked, empty the trays onto a large sheet of greaseproof paper and break up any clumps. 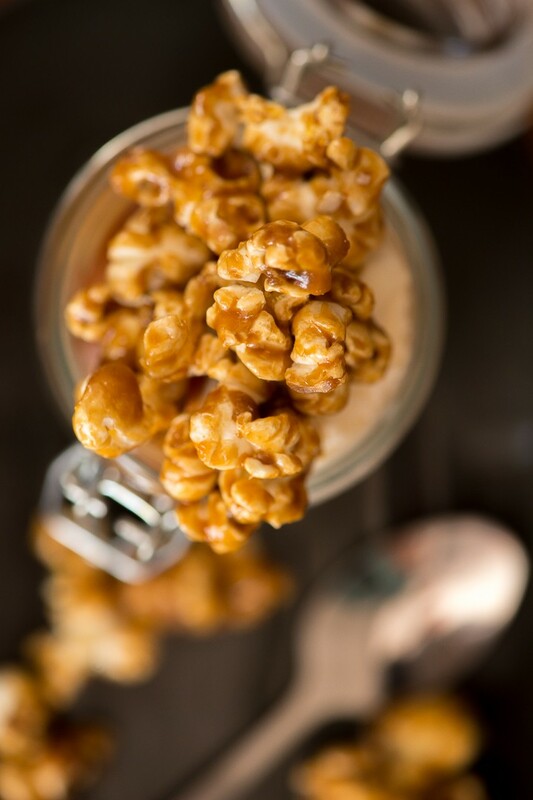 Leave the caramel popcorn to cool completely, then store in an airtight container. When you are ready to serve, warm the caramel sauce gently by placing the jar in a bowl of hot water. 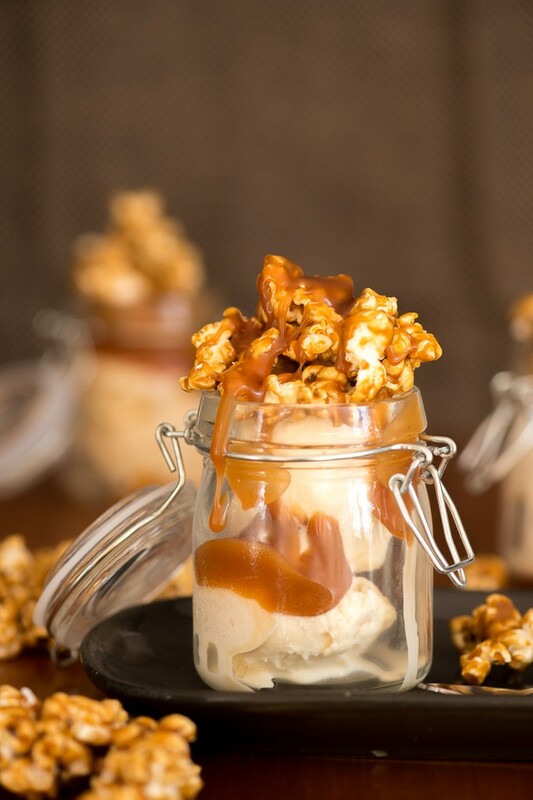 Place 2-3 scoops of ice cream into each bowl, then drizzle warm caramel sauce and top with the caramel popcorn.